In September 1999 an investigative team from the Associated Press broke a story that shocked America. Fifty years before, they claimed, refugees caught up in the Korean War were shot and strafed by US forces. Jeremy Williams explores the repercussions of a brutal episode in Cold War history. The Korean War was a bloody conflict. It left Korea, North and South, with several million dead and the UN forces involved in the fighting with over 100,000 casualties. But despite fighting as intense and as violent as any other conflict since World War Two, Korea has always been history’s ’Forgotten War’. ...US commanders repeatedly, and without ambiguity, ordered forces under their control to target and kill Korean refugees caught on the battlefield. While atrocities conducted both by North and South Korean forces have already been documented, recently a much darker side to the US involvement in the Korean War has begun to emerge. It casts a shadow over the conduct of US forces during the conflict, particularly of officers and generals in command. Declassified military documents recently found in the US National Archives show clearly how US commanders repeatedly, and without ambiguity, ordered forces under their control to target and kill Korean refugees caught on the battlefield. More disturbing still have been the published testimonies of Korean survivors who recall such killings, and the frank accounts of those American veterans brave enough to admit involvement. The Korean War began on 25 June 1950 when communist North Korea invaded the South with six army divisions. These North Korean forces, backed by impressive Soviet equipment including tanks, made quick gains into the territory. The United States decided to intervene in the defence of the South and, taking advantage of the Soviet absence from the UN Security Council, proceeded to press for UN resolutions condemning the invasion. Days later a resolution was passed calling upon member countries to give assistance to South Korea to repulse the attack. General Douglas MacArthur, then in charge of US forces in the Pacific and of the occupation of Japan, was appointed commander of the joint forces. Things began to go wrong almost immediately for the American troops. Those who were rushed to the front line straight from occupation duty in Tokyo in July 1950 were undertrained and underprepared. They were also badly led and quickly defeated by superior North Korean forces. US commanders were outmanoeuvred by North Korean units using guerrilla methods to target US lines from the rear. But there was another problem. The surprise attack from the North had generated a very real refugee crisis. Just weeks after the conflict had begun, up to two million refugees were streaming across the battlefield ; they clogged the roads and the UN lines. Under pressure and fearing North Korean infiltration, the US leadership panicked. Soon command saw all civilians as the enemy regardless. On 26 July the US 8th Army, the highest level of command in Korea, issued orders to stop all Korean civilians. ’No, repeat, no refugees will be permitted to cross battle lines at any time. Movement of all Koreans in group will cease immediately.’ On the very same day the first major disaster involving civilians struck. ...up to 400 South Korean civilians gathered by the bridge were killed by US forces from the 7th Cavalry Regiment. The stone bridge near the village of No Gun Ri spans a small stream. It is similar to a great many others that cross the landscape of South Korea, except that the walls of this bridge were, until very recently, pockmarked by hundreds of bullet holes. On the very day that the US 8th Army delivered its stop refugee order in July 1950, up to 400 South Korean civilians gathered by the bridge were killed by US forces from the 7th Cavalry Regiment. Some were shot above the bridge, on the railroad tracks. Others were strafed by US planes. More were killed under the arches in an ordeal that local survivors say lasted for three days. Corroborating the Korean survivors’ testimony are the accounts of 35 veterans of the 7th Cavalry Regiment who recall events at No Gun Ri. Perspectives differ, but the detailed memories of veterans recalling events burnt into their souls by their first days in combat are as painful as they are shocking. Along with the My Lai atrocity 20 years later in Vietnam, the killings discovered at No Gun Ri mark one of the largest single massacres of civilians by American forces in the 20th century. 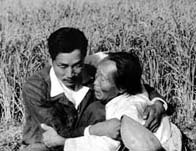 When the news of the killings at No Gun Ri was first broken by a team of investigative journalists from the Associated Press in September 1999, the effects were to be as seismic as the allegations themselves. America was deeply shocked by the AP report. Previously, the US Army had dismissed the claims of South Korean survivors who, since 1960, had been trying to tell the truth about the killings at No Gun Ri. The Army said that US forces were not even in the area of No Gun Ri at the time of the killings. But not only did new evidence put No Gun Ri firmly within the US 7th Cavalry area of operations at the time, the discovery of US veterans willing to talk about events 50 years later made the massacre undeniable. The Clinton administration quickly directed that the Pentagon, specifically the Army, conduct an investigation into what actually happened at No Gun Ri. ...as late as January 1951, the US 8th Army was detailing all units in Korea that refugees be attacked with all available fire including bombing. Since the original AP report, more documents detailing refugee ’kill’ orders have been unearthed at the US national archives. They point to the widespread targeting of refugees by commanders well after No Gun Ri. In August 1950 there were orders detailing that refugees crossing the Naktong River be shot. Later in the same month, General Gay, commander of the 1st Cavalry Division (of which the 7th Cavalry Regiment involved at No Gun Ri was part), actually ordered artillery units to target civilians on the battlefield. And as late as January 1951, the US 8th Army was detailing all units in Korea that refugees be attacked with all available fire including bombing. New allegations have also emerged of the indiscriminate killing of civilians in Korea. In August 1950, 80 civilians are reported to have been killed while seeking sanctuary in a shrine by the village of Kokaan-Ri, near Masan in South Korea. Other survivors recall 400 civilians killed by US naval artillery on the beaches near the port of Pohang in September 1950, and dozens of villages across southern South Korea report the repeated low-level strafing by US planes of ’people in white’ during July and August 1950. A total of 61 separate incidents involving the killing of civilians by US forces are now logged with the South Korean authorities. The Pentagon inquiry into No Gun Ri was finally released in January 2001. The basis of its conclusions are doubtful. The investigation acknowledged the killing of civilians at No Gun Ri by US forces, but it concluded that the killings that took place there were not deliberate attacks but ’an unfortunate tragedy inherent to war’. ...clear orders had been given by command not to let refugees through the lines. Yet whatever the confusion on the battlefield at the time, clear orders had been given by command not to let refugees through the lines. More importantly, documents showed orders had actually been received by the 8th Cavalry Regiment, sister to the 7th Cavalry involved at No Gun Ri. ’No refugees to cross the line. Fire everyone trying to cross the lines. Use discretion in the case of women and children.’ This was an order from the headquarters of the 1st Cavalry Division. Despite this the Pentagon maintains in the report that no orders were issued to shoot refugees at No Gun Ri. This rather narrow frame of reference effectively ignores whatever evidence there might be of other orders given at the time to treat civilians as the enemy. Only orders specifically mentioning No Gun Ri would qualify. Even so this is a surprising conclusion to draw for a number of other reasons. ...a significant number of the veterans interviewed did in fact recall orders to open fire on the civilians at No Gun Ri. Firstly, the oral testimony given by veterans of the 7th Cavalry to the Pentagon during its 14-month investigation may contradict the Pentagon’s position. This evidence has never been made fully public, but what has been discovered by those allowed access to the material, is that a significant number of the veterans interviewed did in fact recall orders to open fire on the civilians at No Gun Ri. The inconsistencies that surround the Pentagon’s investigation have even led those brought in as independent advisors to voice doubts. Pete McCloskey, a decorated Korean War veteran and former Congressman, was brought in to advise on the Pentagon report. He was disappointed with what was finally published. ’I think the American government, the Pentagon and most government agencies don’t want to see the truth come out if it will embarrass the government. I think the American government, the Pentagon and most government agencies don’t want to see the truth come out if it will embarrass the government. It is now nearly 50 years since the end of the conflict in Korea. The only major American investigation into the killing of refugees focused exclusively on the activities of the US Army over a small geographic area during one month of a conflict that lasted three years. Contradicting testimony from veterans and Korean survivors, the report concluded that there was no evidence to suggest that orders to kill civilians were given at No Gun Ri. Clearly there are still many unanswered questions over American involvement in Korea, questions that were not answered by the narrow view of the US Army’s investigation. Yet this burden now falls not on those responsible for giving the orders, but on the veterans and survivors alike. Jeremy Williams produced Kill ’em All, a Timewatch documentary about the No Gun Ri killings and American military conduct in Korea.